Despite desperate attempts by Wall Street and London to proclaim their intervention in Libya a success, even going as far as sending their political proxies Nicolas Sarkozy of France and David Cameron of the United Kingdom for a quick photo opportunity at the rebel held airport in contested Tripoli, vast swaths of the nation are still fiercely resisting NATO and their proxy rebel forces. This includes entire cities still standing in defiance against rebel attempts to "starve them out" and dozens of daily NATO airstrikes (NATO report for September 22) aimed at breaking the population's will to fight on. Weeks ago, the rebel forces, led by US State Department and UK Home Office listed terrorists from the Libyan Islamic Fighting Group (LIFG), a subsidiary of Al Qaeda, boldly announced plans to starve out cities resisting their unelected, foreign backed seizure of the North African nation. The London Telegraph reported in an article aptly titled, "Libya crisis: Rebel leaders hoping to starve Gaddafi stronghold of Sirte into submission," that under the cover of heavy NATO bombing rebel leaders hoped "to starve Col Gaddafi's home town of Sirte into submission, laying siege to his last remaining stronghold in an attempt to avoid mass bloodshed, according to the man spearheading efforts for a peaceful takeover." Fox News would relay an AP report on September 2, 2011, that rebel commanders declared, "we want to save our fighters and not lose a single one in battles with Qaddafi's forces. In the end, we will get Sirte, even if we have to cut water and electricity and let NATO pound it with airstrikes." AP cited Mohammed al-Rajali, a spokesman for the rebel leadership in the eastern city of Benghazi. Ironically, the article was titled, "UN Warns Libya is Short of Water, Fuel, Medicine," a crisis admittedly being caused by the premeditated denial for entire cities of critical supplies for their civilian populations, enabled by NATO bombing and under the cover of UN recognition of the terrorist rebels - a move that has soundly resigned the UN's legitimacy and stated purpose to the scrapheap of history. This is also a verifiable war crime. As reported earlier, according to the International Committee of the Red Cross, the denial of humanitarian assistance is a crime under international law. The Red Cross adds that "a massacre is not necessarily committed only with knives." While many will attempt to portray the premeditated creation of a humanitarian disaster as "more humane" than taking the Libya's cities by force - rebels have in fact already tried force, for now over a month, and have been soundly repelled. Now, after weeks of attempting to encircle and starve into submission cities rejecting NATO-backed, UN sanctioned rebel control of Libya, including the southern city of Bani Walid, the "National Transitional Council" is claiming the resulting humanitarian disaster is of Libyan leader Qaddafi's own creation. CNN, in a bout of selective amnesia after reporting earlier that "anti-Gadhafi forces on the outskirts of Sirte and Bani Walid have cut off supplies into the cities and amassed weaponry for heavy battle," has now reported in another article titled, "NTC claims humanitarian disaster in Gadhafi stronghold," that "that Gadhafi forces are robbing food stores, leaving civilian residents to starve." This is just the latest in a long litany of conflicting stories and verified lies spread by the now notoriously deceptive rebels, their equally duplicitous "international" backers, and shamelessly relayed without hesitation by the complicit and clearly compromised mainstream media. A real crime against humanity is being committed in Libya, perpetrated by NATO on behalf of Wall Street and London. As reported earlier, NATO's entire support network and public partners consist of Fortune 500 corporations via the Atlantic Council, which claims to be a preeminent, non partisan institution devoted to promoting transatlantic cooperation and international security. Its sponsors include many of the big oil interests poised to reap a whirlwind of profits over NATO-backed regime change in Libya, namely BP, Chevron, Exxon, and Shell. It also includes defense contractors already enriched by the protracted bloodshed in Northern Africa including Raytheon, BAE, SAAB Technologies, Lockheed Martin, Boeing, General Dynamics, and Northrop Grumman. Additional support comes from the world's largest banks and equity firms, including Goldman Sachs, JP Morgan, Deutsche Bank, Barclays Capital, the Blackstone Group, Citigroup, and Credit Suisse Bank, who are set to benefit not from the liberation of the Libyan people, but the "liberation" of Libya's markets. There is also a tremendous amount of foundation support for the Atlantic Council and thus NATO, each with a nefarious back-story worthy of their own thorough examination, including the Carnegie Corporation of New York , the Ford Foundation, and billionaire bankster George Soros' Open Society Institute. 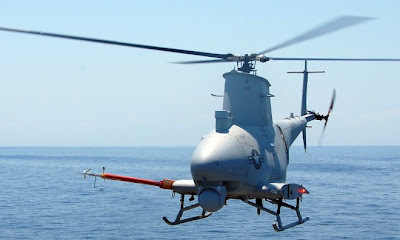 Photos: (Top) Northrup Grumman's MQ-8 Fire Scout, which made headlines as it was shot down over Libya. 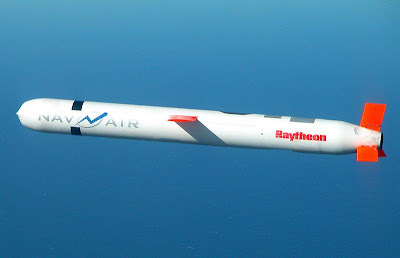 (Below) a Raytheon Tomahawk cruise missile, employed during the opening phases of NATO's military intervention in Libya beginning in March of 2011. Both Northrup Grumman and Raytheon, amongst many other defense contractors are financial sponsors of the Atlantic Council, an epicenter providing political and rhetorical support for NATO's ongoing operations in Libya - exposing an astronomical conflict of interest. But perhaps most alarming is NATO's support via the Atlantic Council by "reputable" news and media agency sponsors, including Thomson Reuters, News Desk Media, Bloomberg (which includes BusinessWeek), and Google. This explains the almost schizophrenic reporting emerging from Libya spinning and obfuscating the truth in a consistently pro-NATO light and goes a long way to explain why rebels are allowed by the "international community" to purposefully starve civilian populations, break Libya's resistance with NATO airstrikes, and somehow manage to place the blame on the civilian populations by merely labeling them as "pro-Qaddafi" and that such atrocities are self-imposed. Logically, one should conclude, if they are indeed repulsed by what is transpiring in Libya at the hands of Wall Street and London, that the corporations, banks, and institutions involved should be exposed, boycotted, and promptly replaced. For other atrocities committed in the wake of NATO's attempt, now over a month ago, to seize Tripoli and declare their mission a success please see "Libya: V-day + 3 Weeks."